In a fast-paced, high-tech world, positive environmental practices often go by the wayside. 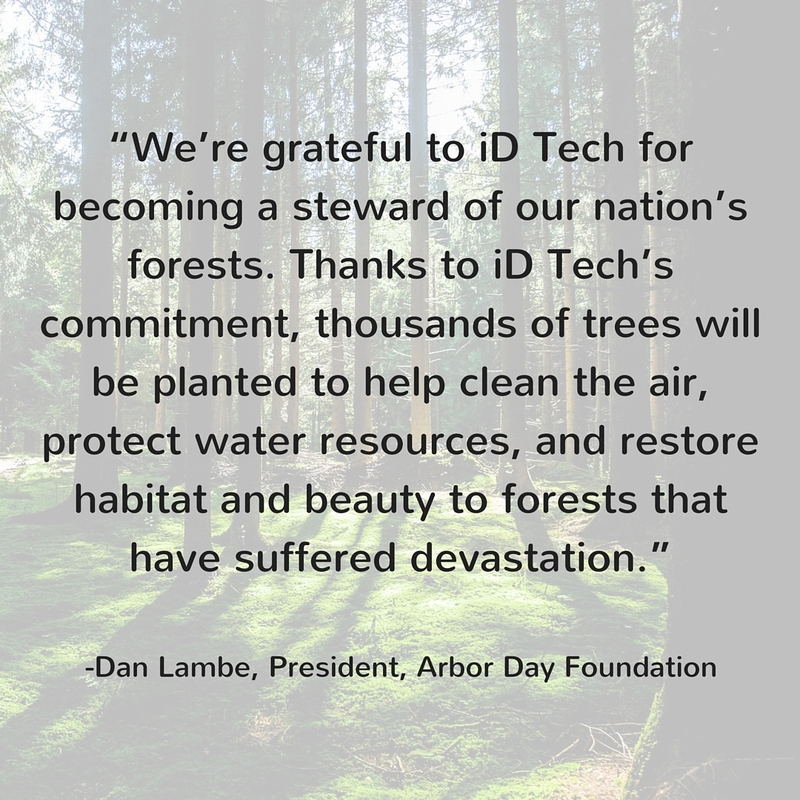 At iD Tech, however, being “green” isn't a side note or an afterthought—it’s a core principle we've been committed to from the get-go. By nurturing a balance between technology and ecology, we strive to be a model of environmental awareness for students, parents, community members, and other businesses. So, what are we actually doing? And where do YOU come in? Through our initiative called One Camper, One Tree, we donate one dollar to the Arbor Day Foundation for each student who registers for camp, and in turn, a tree gets planted. Our ultimate goal? To plant 1 million trees. And we’re well on our way, thanks to students like you. Since the inception of One Camper, One Tree, we’ve sown the seeds for over 155,000 trees and expect to plant nearly 50,000 more in 2016 alone. Every one of these trees signifies a student who has taken their passion for technology to the next level. The impact we're making together is BIG, and the symbolism is strong: whether we're planting seeds of knowledge at camp or bringing new forests to life, the potential for growth and development is limitless. We believe that with the right combination of STEM smarts and life skills (problem-solving, critical thinking, collaboration, etc.) taught at camp, your personal potential to go forth and make the world a better place has never been greater. One Camper, One Tree signifies positive change on an individual and global level. It's no secret that climate change and deforestation are wreaking havoc on our planet. Learn more about some of the recent accomplishments of the Arbor Day Foundation, made possible in part by One Camper, One Tree and students like you. The Barry Point Fire of 2012 burned 16,587 acres of the Modoc National Forest, killing 75% of the tree population. By planting native Ponderosa Pine, the Arbor Day Foundation was able to reestablish forest cover within the burn scar that could otherwise have taken decades to recover on its own. Due to their efforts, local wildlife habitats and water quality also improved. Today, 1,900 acres of the Devils’ Garden Ranger District are now full of healthy trees. In 2012, the Reading Fire began in Lassen Volcanic National Park and burned across 11,000 acres of federal lands, destroying valuable wildlife habitat and badly damaging the local watershed. The goal of the tree planting crew was to restore the affected areas while providing numerous benefits such as wildlife habitat, soil stabilization, clean water, healthy species diversity, and improved wildfire resilience. Within just 10 days of the tree planting crew's visit, over 90,000 Ponderosa Pine, Jeffery Pine, Sugar Pine, Incense Cedar, and Douglas Fir trees covered the massive burn scar. In 2006, the Derby Fire burned a total of 163,908 acres on Los Padres. Immediately, the forest service put together a plan to reforest more than 17,000 acres of land that was considered high severity. The 2013 Zaca and Day Fire restoration began in late March. Over six weeks, over 180,000 Ponderosa, Sugar, and Jeffrey Pine trees were planted by a crew of 12-14 people. Without the help from partners, friends, and donors, these areas would likely not have recovered. The 700-acre project was burned by both the 2007 Wallow Fire and the 2012 Stafford Fire. Many areas burned with high severity, leaving little to no seed source behind for future regeneration. The goal of the 2013 planting effort was to plant 92,700 Ponderosa Pine, Incense Cedar, Sugar Pine, and Douglas Fir trees. This area is being reforested due to insect issues and clear-cutting. The trees are helping to reestablish the area, while providing a habitat for the Kirtland’s Warbler, a local endangered bird. Inspired by the efforts of the Arbor Day Foundation and want to help? Attend camp this summer and learn something AWESOME. We'll plant a tree for you. Find a camp near you and register today to secure your first choice of locations, courses, and dates.